I swear this is that last Addams Family post for the year. Ha! I figured I need to lay out all of our costumes in one post. 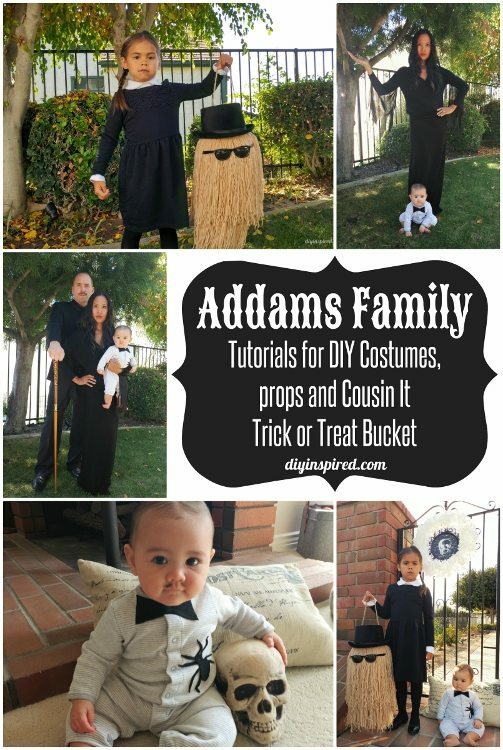 That way, if your family is considering being the Addams Family, this DIY Addams Family Halloween Costumes post would be a good reference guide. So, here is what we did for each of our characters. We bought her pieces as separates so that she could wear them individually again. I bought the dress at Carter’s, the shirt and tights at Target, and her shoes (which she already had) are from Payless. You can see more of her pictures in this post. The best part is that this costume is warm and comfortable. I raided my closet for items I already had. All I did was change my shirt a little. Both my shirt and skirt were cotton so it felt like I was wearing pajamas! I spent $2.99 total on my outfit and was super comfortable. I bought a $2.00 can of black temporary hair spray color. It washes right out. We had a hard time finding a suit jacket so we found a black button up at Goodwill for about $5.00. We also found suspenders and a bowtie there. I also made a can for my husband per his request out of a few odds and ends. My daughter insisted that her baby sister be Pubert so I picked up Target and made this cute little Pubert costume. I used baby oil to slick her hair back. So I know we are missing a few family members but if you decide to be the Addams Family for Halloween I hope this helps!